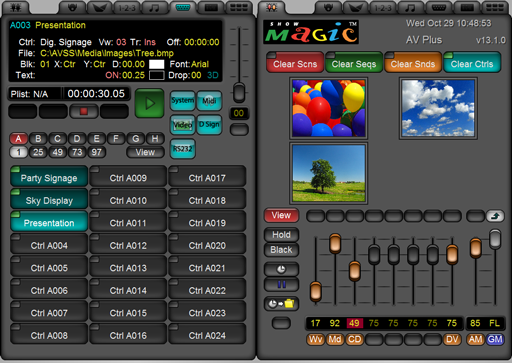 ShowMagic AV Plus builds on the functionality of ShowMagic AV and adds support for more video and display outputs, the ability to synchronise multiple videos and control for up to 2048 channels of DMX. * Feature is in experimental status. Please Note: These specifications are intended as a guide to the minimum system requirements needed for the ShowMagic software to run. Due to the number of factors that affect performance, they do not guarantee smooth operation / playback in all circumstances. Depending on how the software is intended to be used, additional / more powerful hardware may be needed. For advice on hardware specifications, please contact your preferred ShowMagic reseller, or AVSS Ltd. directly.